Crevice corrosion (beneath a seal) on a stainless steel flange exposed to a chloride-rich medium. This form of attack is generally associated with the presence of small volumes of stagnant solution in occluded interstices, beneath deposits and seals, or in crevices, e.g. at nuts and rivet heads. Deposits of sand, dust, scale and corrosion products can all create zones where the liquid can only be renewed with great difficulty. This is also the case for flexible, porous or fibrous seals (wood, plastic, rubber, cements, asbestos, cloth, etc.). 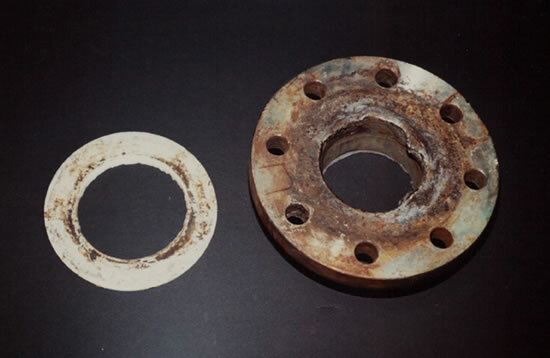 Crevice corrosion is encountered particularly in metals and alloys which owe their resistance to the stability of a passive film, since these films are unstable in the presence of high concentrations of Cl- and H+ ions. The basic mechanism underlying crevice corrosion in passivatable alloys exposed to aerated chloride-rich media is gradual acidification of the solution inside the crevice, leading to the appearance of highly aggressive local conditions that destroy the passivity. in an interstice, convection in the liquid is strongly impeded and the dissolved oxygen is locally rapidly exhausted. A few seconds are sufficient to create a "differential aeration cell" between the small deaerated interstice and the aerated remainder of the surface. However, "galvanic" corrosion between these two zones remains inactive. 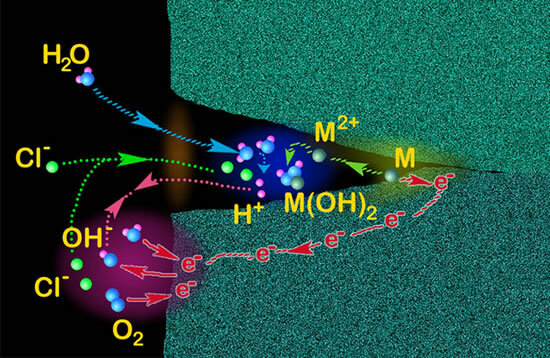 As dissolution of the metal M continues, an excess of Mn+ ions is created in the crevice, which can only be compensated by electromigrationof the Cl- ions (more numerous in a chloride-rich medium and more mobile than OH- ions). Most metallic chlorides hydrolyse, and this is particularly true for the elements in stainless steels and aluminium alloys. The acidity in the crevice increases (pH 1-3) as well as the Cl- ion concentration (up to several times the mean value in the solution). The dissolution reaction in the crevice is then promoted and the oxygen reduction reaction becomes localized on the external surfaces close to the crevice. This "autocatalytic" process accelerates rapidly, even if several days or weeks were necessary to get it under way. 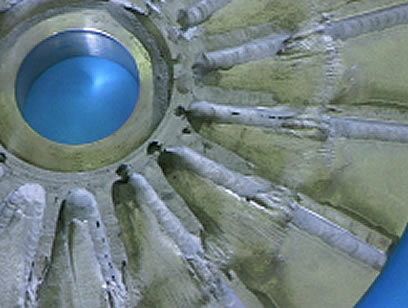 Means of preventing or limiting crevice corrosion : Use welds rather than bolted or riveted joints, design installations to enable complete draining (no corners or stagnant zones), hydrofuge any interstices that cannot be eliminated, and in particular, grease all seals and seal planes, use only solid, non-porous seals, etc.